Anyone with just a passing knowledge of boating and fishing will recognise the iconic Kiwi boat marque Haines Hunter, but the man long associated with it, Lionel Sands, might be less familiar. To appreciate Lionel’s involvement in boat manufacturing and his love of the sea, we need to go back a couple of generations. Lionel’s grandfather Marmaduke Lionel Sands was a keen outdoorsman. 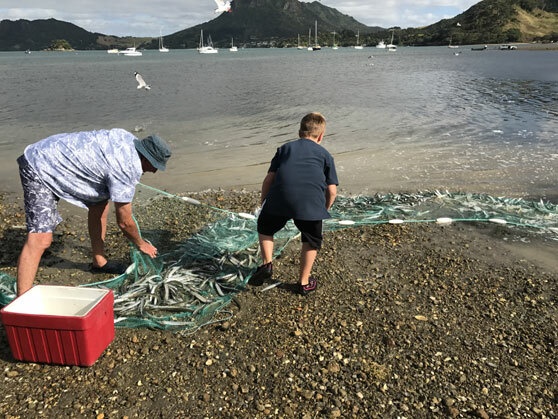 He used to take his family camping in Urquharts Bay on the northern shores of Whangarei Harbour, close to the harbour’s entrance. In 1948, Lionel’s dad Sandy made the tie to the area more permanent, building a family bach, with Lionel and his family spending as much time there as possible in following years. Few would know the area as well as Lionel, a legacy from Sandy who at one stage commercially fished the Bream Bay/ Hen and Chicks area from a sail-powered 7.9m (26ft) mullet boat. There were no engines in those days, but the fish were so prolific you didn’t have to go far to catch them, even hapuku. Lionel described his dad as a ‘fish whisperer’ – he seemed attuned to their every move and anticipated when they would bite. Like many young men of his generation, Sandy became embroiled in the second World War and ended up being captured, spending four years as a POW. After his release, he worked with the famous sailor and naval architect Uffa Fox, based at the home of British yachting, the Isle of Wight. Bringing his new-found skills home, Sandy used his £500 repatriation loan to establish a boat-building yard, where the current Miller Moyes Seacraft premises is located today in Ellerslie’s Cawley Street. “Dad had the option of a block of Waikato dairy land – and that would have been nice – but chose to go down the boat-building route,” Lionel says. The money was used to buy the land, pay the staff wages, and get the show on the road. Seacraft Limited was up and running. Initially the business turned out carveland clinker-built wooden boats, Sandy having the foresight to purchase a 1000- acre block of land in the nearby Hunua Ranges, used to grow and harvest timber for building boats. In 1967 he made the transition to manufacturing fibreglass hulls – the Valencia, Costa Mesa, Sierra and Catalina were among the first models. But Sandy was more resourceful than that. Up until then, Seacraft Ltd had been a manufacturing retailer with no dealer network. He teamed up with Les Miller of Miller Moyes, whom Sandy recognised as a professional retailer, and between them they established a dealer network. They gained the rights to manufacture the Australian brand Haines Hunter, and four years down the track purchased the moulds, design rights, trade marks etc. Haines Hunter introduced a new design on the New Zealand market – the V198 – and soon it was being sold throughout the country. Recognised as a great blue water trailer boat, the Haines Hunter V198 was a craft many people admired and aspired to own – one of many to come out of the Miller Moyes Seacraft and win favour with the boating public. The Haines Hunter SF700 ‘Mark I’ model came out of the moulds in 1986, just in time for the IMTEC show – a forerunner of today’s Auckland On the Water Boat Show – and it was an instant hit, with 25 sold over the three days. Slowly the Haines Hunter range was developed to incorporate the options boaties enjoy today. The Haines Hunter mantra – ‘It’s in the ride’ – is something Lionel is proud of. Given the above history, it is no wonder Lionel has a passion for the outdoors, fishing especially – he was born to fish and hunt. 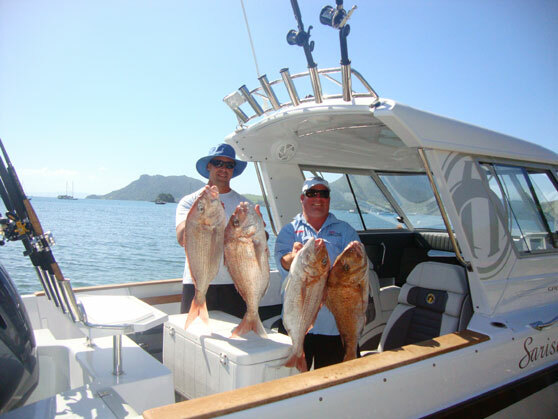 Modern technology, including better electronics and more reliable outboards, has seen today’s boatie demand more of their craft, so they can head further afield and stay out for longer. 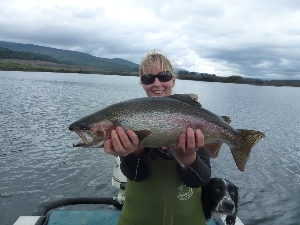 Similarly, from their Urquharts Bay holiday base, a trip to the Hen and Chicks was always a big excursion – and going out to the Mokohinaus was something dreams were made of. 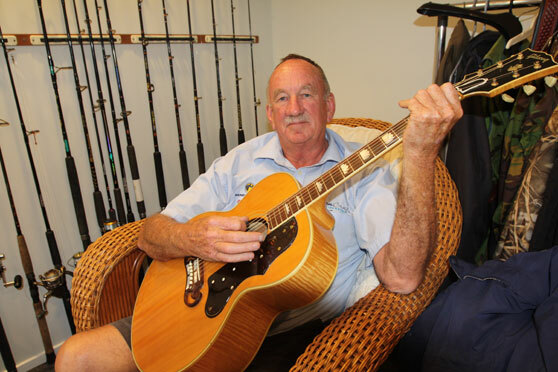 While Lionel is passionate about his fishing, hunting and shooting are also among his interests, along with music. The trout thrived, the partridges did not. A young Lionel accompanied his dad in the field, adding another string to his outdoors bow in the process. Lionel still enjoys deerstalking, waterfowl and upland bird shooting, although an overseas experience was a reality check for the latter. He joined in a driven hunt on an English game estate where over 400 pheasants, bred for the purpose, were ‘harvested’. “While privileged to be part of the driven shoot, it took me a while to re-ignite the passion to start hunting wild pheasants again. For Lionel, the thrill is in the hunt, not necessarily the kill or the catch. Lionel is a little bit old school when it comes to his fishing. While he will softbait and work a jig, he likes nothing better than anchoring up and straylining a big piper or pilchard down a berley trail. To this end, once or twice a season, he and the family will run a bait net and catch their own piper, which are vacuum packed in convenient lots and quickly frozen for future use. One of his favourite haunts is the area just outside the Whangarei Harbour that runs from Mair Bank south to Ruakaka. You will see Lionel out there in the latest Haines Hunter trying his luck with both soft-baits and natural baits early in the morning. All of Lionel’s boats have been named Sarisha, a combination of his and wife Peggy’s two daughters’ names – Sarah and Melisha. Only one of Lionel’s daughters shares the same passion for the sea – Sarah. As already mentioned, Lionel’s other big passion is music. As a student at Saint Kentigern’s College, Lionel sang in the choir and always had a hankering for playing the guitar. Lionel is self-taught and attributes friend Keith Patterson’s patience and tutoring skills for moulding him into a ‘passable’ guitarist. Lionel enjoys nothing more than a jam session with a few like-minded buddies, sitting around over a rum or two, sharing the passion for a popular melody. So, regardless if it is a guitar, rod, rifle or shotgun in his hands, Lionel Sands was born to do it.